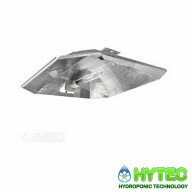 Reflectors focus light onto the lumens of plants, offering them the exact amount of light they need during different cycles (from germination to flowering), as well as limiting the loss of unused light rays. 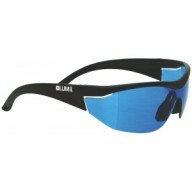 To view our range of Reflectors, click on the sub-categories below. 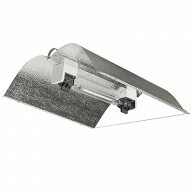 LUMii EURO The LUMii EURO SHADE is a simple and easy-to-use reflector It is an open ended highly polished and dimpled lightweight reflector that gives an efficient and even distribution of light. 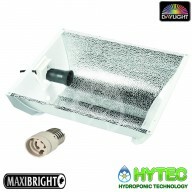 Unlike others on the market, includes a unique lamp holder that is adjustable and designed t..
DAYLIGHT EURO REFLECTOR (315W ONLY) Maxibright has added a NEW Daylight Euro reflector to it’s range. 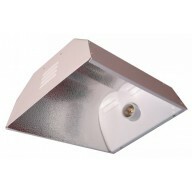 Designed and optimised for specific use with the Daylight 315 lamp. 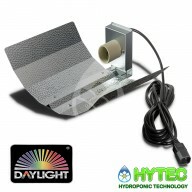 The Daylight Euro reflector is manufactured from quality materials and offers an even, distribution of light, ov..
SunKing AERO 8 Reflector Height 16cm Width 65cm Length 65cm Maximises the effectiveness of your Cool Shade Superb, uniform light spread Premium grade components Eliminates hotspots in the grow area Highly reflective hammer-tone silver finish Fits directly onto to glass of the ..
Gavita Pro W 150 DE reflector Features & Benefits Replacement reflector for Gavita Pro line & HortiStar Easy to install, no tools required Wide spread for optimal uniformity (150° beam angle) Suitable for 750-1000W HPS double ended lamps Made from Vega/MIRO aluminium, ..
CoolTube 125mm-5" The Cooltube or Coolshade as it is sometimes known is a clear glass tube with a lamp mounting bracket in its centre, when used with fans and 150mm ducting, not supplied, can be made into a fully airtight unit. 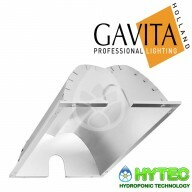 Capable of using 150w, 250w, 400w, 600w and 1000w single ended l..
Gavita Pro M 110 DE SR reflector Features & Benefits Replacement reflector for Gavita Pro line & HortiStar Easy to install, no tools required Medium spread for optimal uniformity in small rooms (110° beam angle) Suitable for double ended 750-1000W HPS Most suitable for..
Sol Digital DE Stealth Adjusta Reflector for Double Ended Super HPS Lamps A simple but effective design for a Hydroponics Reflector. Made from strong aircraft grade aluminium, parabolic curves for optimal light spread and a high reflectivity that won't quit. 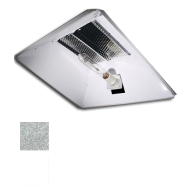 Designed specifically for Double ..
Emperor Horizontal High gloss white or silver, symmetrically designed horizontal reflector with vented top plate to disperse heat build up. The Emperor has an elliptically designed diffuser plate to provide maximum light dispersal whilst ensuring an even distribution of light. 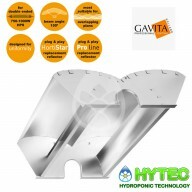 Dimensions..
SUNKING GREAT 8 REFLECTOR Sun King has built a reputation for manufacturing some of the highest quality reflectors available in the horticultural industry. Sun King use the highest quality metal and components available, other reflectors may look similar but believe us they are not all reflectors.. 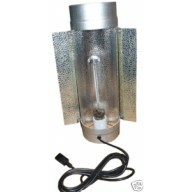 Accepts PowerPlant Envirogrow CFL lamps and other makes of CFL lamps upto 250w. 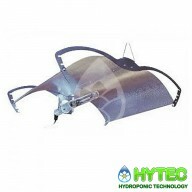 The Sun Mate Grow Reflector can be used either horizontally or vertically inside or outside the plant canopy. 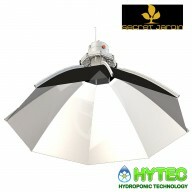 This product brings together all the bennefits of a closed dual parabolic design with the energy efficiancy of..
DAISY 60CM SECRET JARDIN First umbrella-type reflector thats Compatible with HPS and CFL lamps (600W max) Security with thermal protection +40% light efficiency compared to standard reflectors (1800 μmol/m²/s) Can be set closer to plants without over heating. 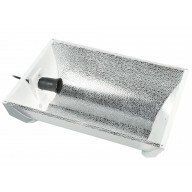 &nb..
Maxibright Supernova Mini 315w cdm The Maxibright Supernova Mini is a wide angled parabolic reflector with a highly reflective anodised aluminium insert. The Supernova provides a wide and even distribution of light. 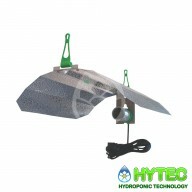 Key Features: Flying IEC connection PGZ18 fittting for 315w cdm bulb ..
Parabolic White Reflector The parabolic hammered reflector is a large umbrella shaped reflector which is 100cm in diameter and a vertical lamp fitting, emiiting the high heat output from yhr bulb outwards which allows you to place the shade closer to the growing plant cannopy. It comes ..
Mantis Reflector The wings on the Mantis Reflector form a succession of perfect dual-parabolic shapes when assembled. 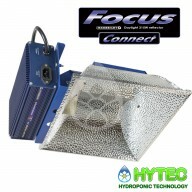 This enables growers to focus light spread and intensity according to their individual needs. 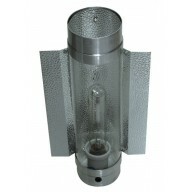 When adjusted to wide settings, it may be positioned very near to the plants for both..
CoolTube 150mm-6" The Cooltube or Coolshade as it is sometimes known is a clear glass tube with a lamp mounting bracket in its centre, when used with fans and 150mm ducting, not supplied, can be made into a fully airtight unit. 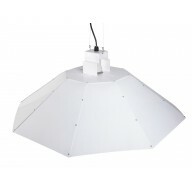 Capable of using 150w, 250w, 400w, 600w and 1000w single ended lamps ..
DAISY 80CM SECRET JARDIN First umbrella-type reflector thats Compatible with CMD and CHM lamps (315W max) Security with thermal protection +40% light efficiency compared to standard reflectors (1800 μmol/m²/s) Can be set closer to plants without over heating. 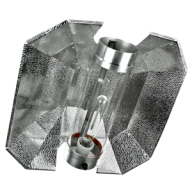 F..
SuperNova Reflector The Supernova reflector is a top notch reflector providing an excellent light spread providing very good results, featuring closed ends and manufactured using quality dimpled aluminium for hot spot prevention making it one of our favorites. 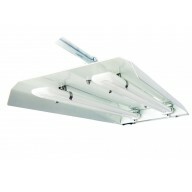 The Maxibright ..
MAXIBRIGHT FOCUS CONNECT 315W Powered by the Maxibright Daylight 315W ballast the Focus Connect reflectors are compact, highly reflective and suitable for use as standalone lighting or to supplement other lighting. 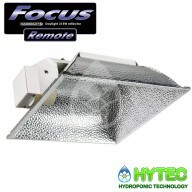 The Daylight 315 ballast fixes simply to the Focus Connect by two fixing poi..
MAXIBRIGHT FOCUS REMOTE 315W Powered by the Maxibright Daylight 315W ballast the Focus Remote reflector are compact, highly reflective and suitable for use as standalone lighting or to supplement another lighting. This is a true plug & play product. 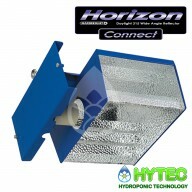 Giving an ideal coverage over ..
MAXIBRIGHT HORIZON CONNECT WIDE-ANGLE 315W The horizon connect has the option to connect you ballast to the shade if you want to add extra heat to your grow room or don't have space for the ballast anywhere else. 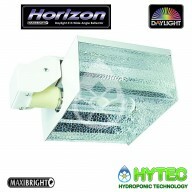 The heat that is generated from the lamp surface is not transferred dir..
MAXIBRIGHT HORIZON 315W The heat that is generated on the lamp surface is not transferred directly to the plant, but indirectly, with air acting as a carrier. 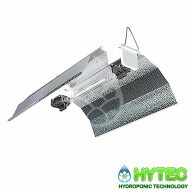 Using the open reflector concept, a natural air current is created, with which the heat is distributed evenly throughout the environment, ..
KEY FEATURES EMIITS VERY LITTLE HEAT ALLOWS CLOSE POSITIONING TO PLANTS COMPACT LIGHT WEIGHT DESIGN THREE TUBE OPTIONS ENERGY EFFICIENT LOW PURCHASE PRICE EASY CHANGE BULBS​​ TUBE OPTIONS CUTTINGS -BLUE GROWING-GREEN BLOOMING -RED TN2 CONTENTS ..